Definition: Cachexia (pronounced Kuh-KEK-see-uh), or wasting syndrome, is a condition that causes extreme weight loss and muscle wasting. It is a symptom of many chronic conditions, such as cancer, chronic renal failure, HIV, and multiple sclerosis. It occurs when the body of the sick person releases certain substances that keep new muscles from growing. Thus, even when they eat more, they find it very hard to gain weight. Without enough muscle mass and energy, many patients are too weak to undergo any form of treatment. This can further worsen their condition and their prognosis. In oncology, cachexia is believed to be the cause of death in up to 40% of cancer cases. Up to 80 percent of people with late-stage cancer have cachexia. Close to one-third of people with cancer die from this condition. Tumor cells release substances that reduce appetite. Cancer and its treatments can also cause severe nausea or damage the digestive tract, making it hard to eat and absorb nutrients. As the body gets fewer nutrients, it burns fat and muscle. Cancer cells use what limited nutrients are left to help them survive and multiply. Causes and Risk factors of Cachexia: Cachexia is often seen in end-stage cancer, and in that context is called cancer cachexia. Patients with congestive heart failure can have a cachectic syndrome. Also, a cachexia comorbidity is seen in patients who have any of the range of illnesses classified as a chronic obstructive pulmonary disease. People with cachexia have abnormal levels of certain substances in their body. These imbalances cause weight loss and muscle wasting. 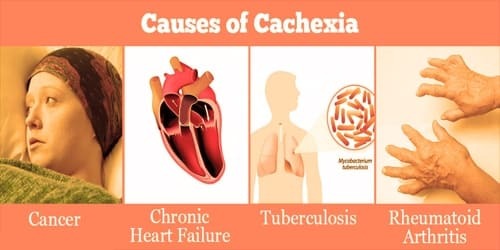 A number of factors contribute to cachexia, including the levels of these substances, the conditions that cause them, and the reaction they provoke from the body. 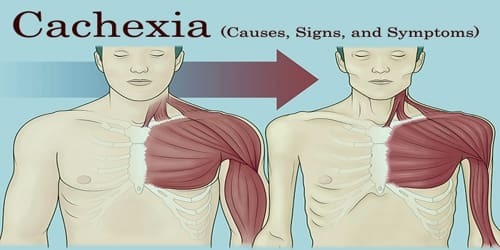 Signs and Symptoms of Cachexia: Cachexia causes patients to lose lots of weight and muscle mass. 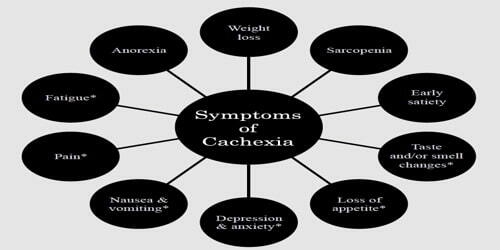 Patients suffering from cachexia for a very long time have an increased risk of dying. This is because the disease causes them to continuously lose fat and muscle that their body needs to store food and glucose. Without enough supply of these nutrients, many organs in the body will start to shut down.